Spotify is a digital music, podcast and video streaming service with over 30 million songs, 100 million monthly active users and 50 million paying subscribers. 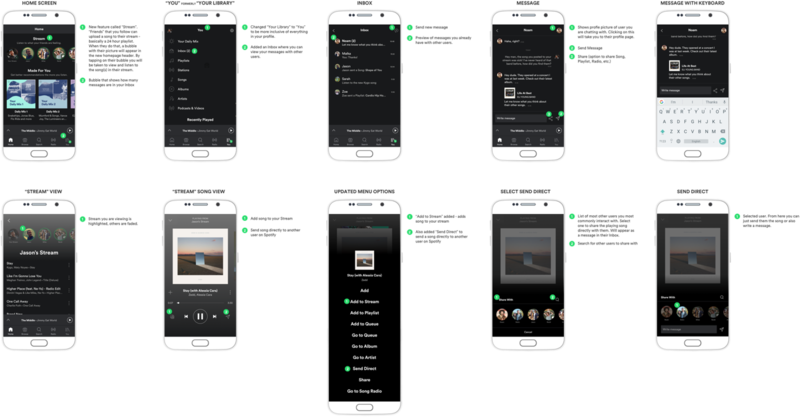 Spotify currently offers basic social features, such as sharing playlists and the ability to follow friends & artists to see what they are listening to, but the features are not what they could be and there is plenty of room for improvement. The Research Plan was created in order to help define the target market and to discover their views on music and music sharing. First, I conducted seconday reseach to better understand Sptofy's history and goals, the target market and the existing product/ market space. Next, I conducted primary research through 70 online surveys and 3 in-person interviews. 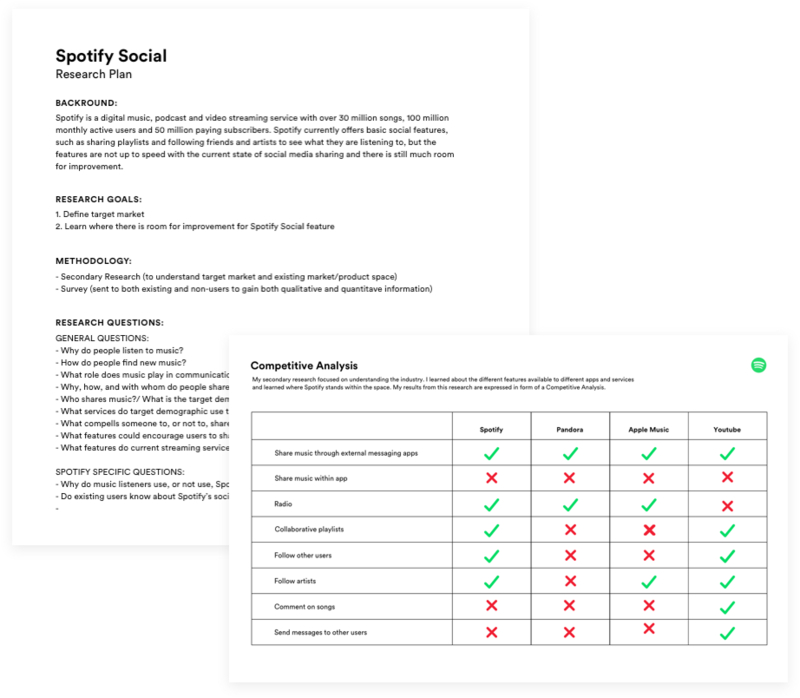 My primary research focused on understanding why people use social media and their sharing features and how people relate to and share music. 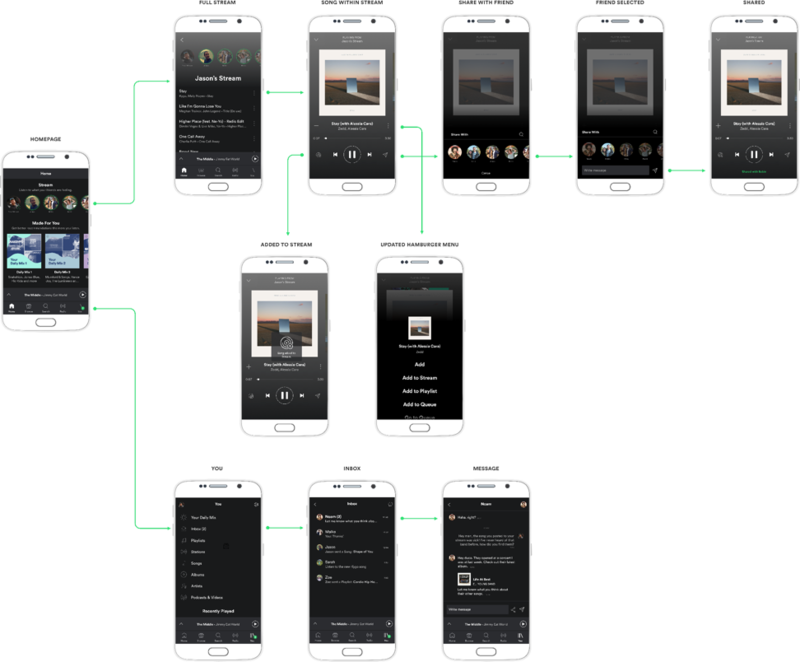 Users need a very easy and seamlessly designed way to share music with others. 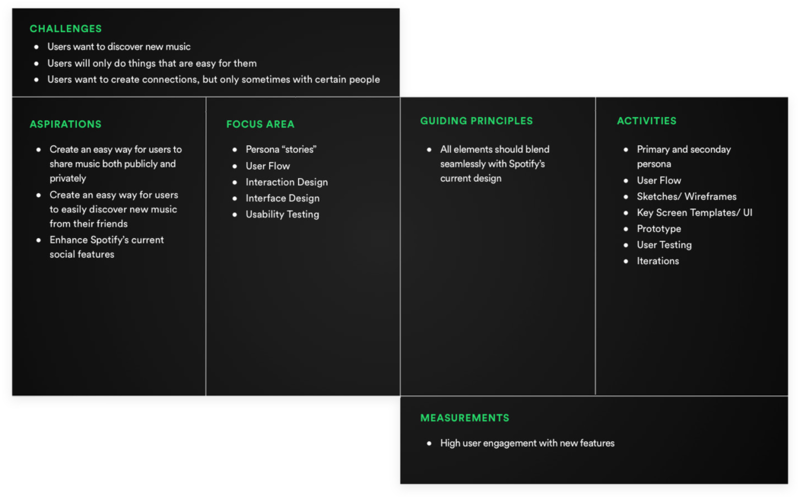 In order to understand my key users better, I created a primary persona, primary persona empathy map and a secondary persona. 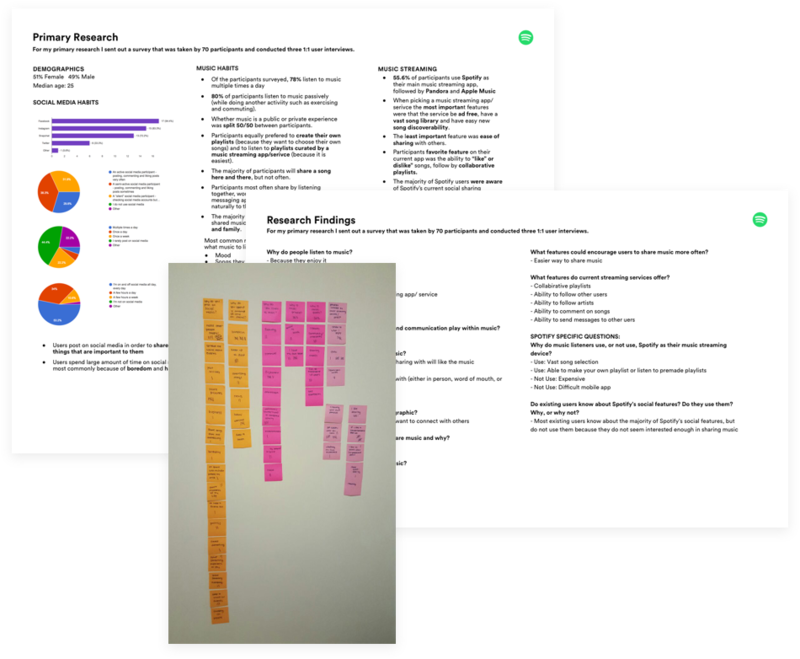 Next, I created a UX Strategy Blueprint to clearly define the challenges of the project and to devise a way to overcome those challenges towards a specific outcome. There are two main features I will introduce to Spotify. The first is a Stream. Streams are 24 hour playlists (similar to "Stories" on Snapchat, Instagram and Facebook) compiled by your friends. Streams appear at the top of your Spotify homepage and can be easily added from any playing screen. The familiar pattern along with the convenience will motivate users to utilize this new feature as an easy way to share and discover new music with friends. To enhance the music sharing capabilities of Spotify, I will be bringing back in-app messaging. Spotify had previously removed this feature, but I believe that a redesign with better integration will allow this feature to succeeded where it has previously failed. New messages will be clearly displayed on the Homepage and redesigned "You" page; and direct song and message sending will be featured more prominently on appropriate menus to promote usage. 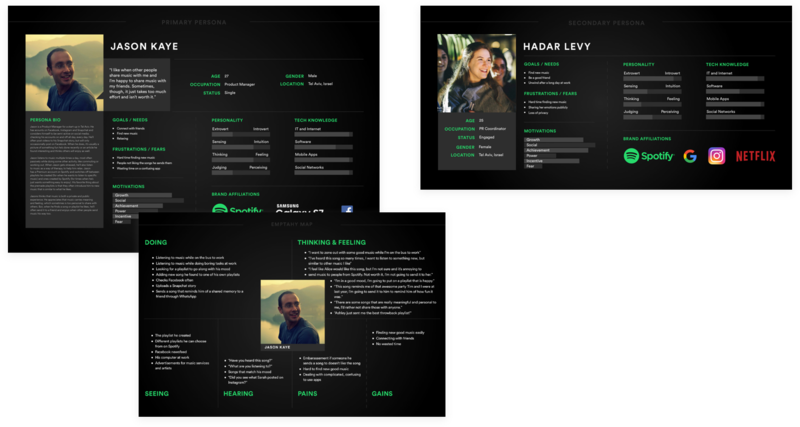 The "Search" and User Profile pages will also be updated to reflect a more social interaction. 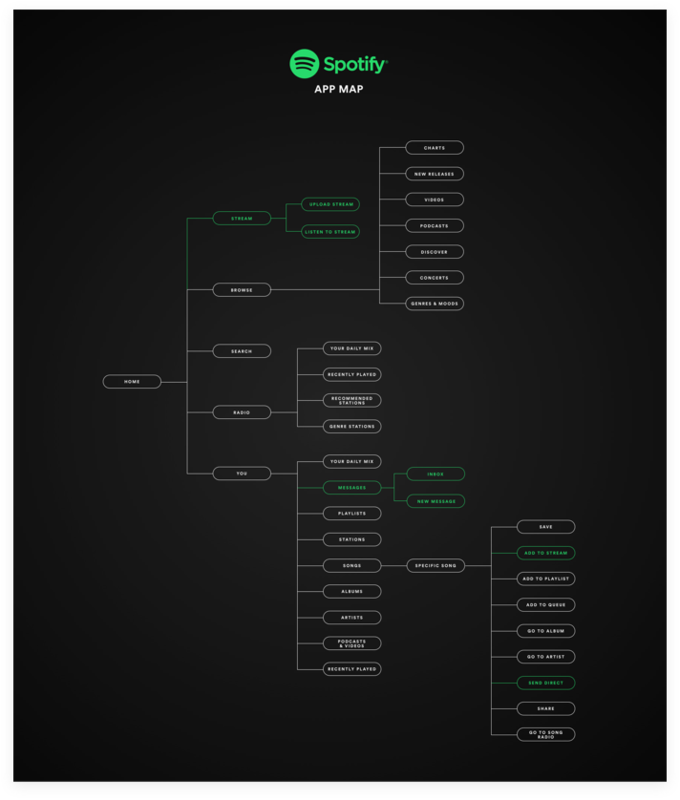 I created an app map to see the current architecture of the Spotify app, and where my new features will fit in. The app map also illustrates the potential user flow. 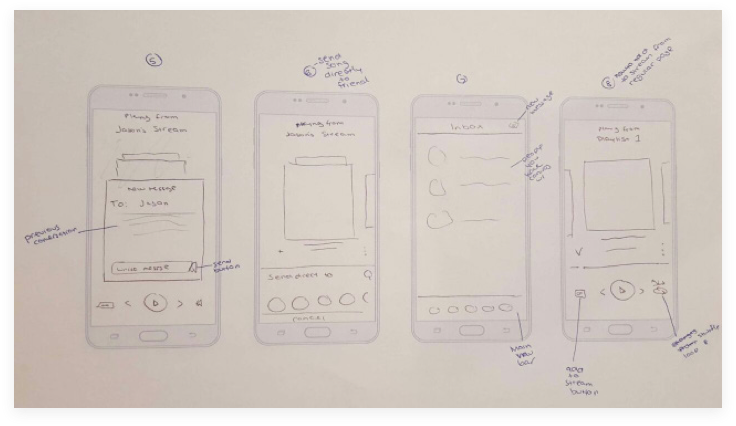 Based on the app map, I created rough wireframes sketches of the key new screens. Since Spotify has a set UI style, I went straight from my sketches to full UI mockups. I created a user flow with the key screens to see how a user would navigate through the new features, and to insure there were no missing gaps. 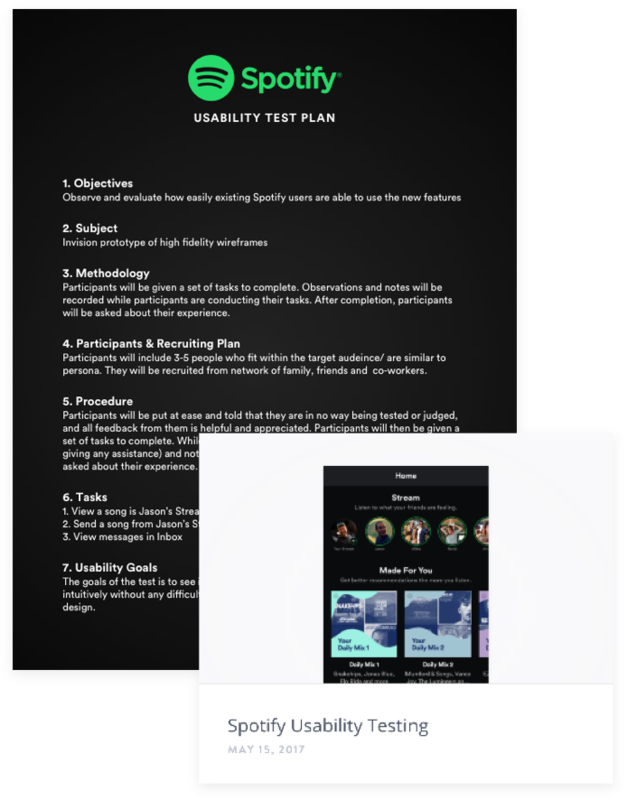 A prototype was created in Invision App for the testing. 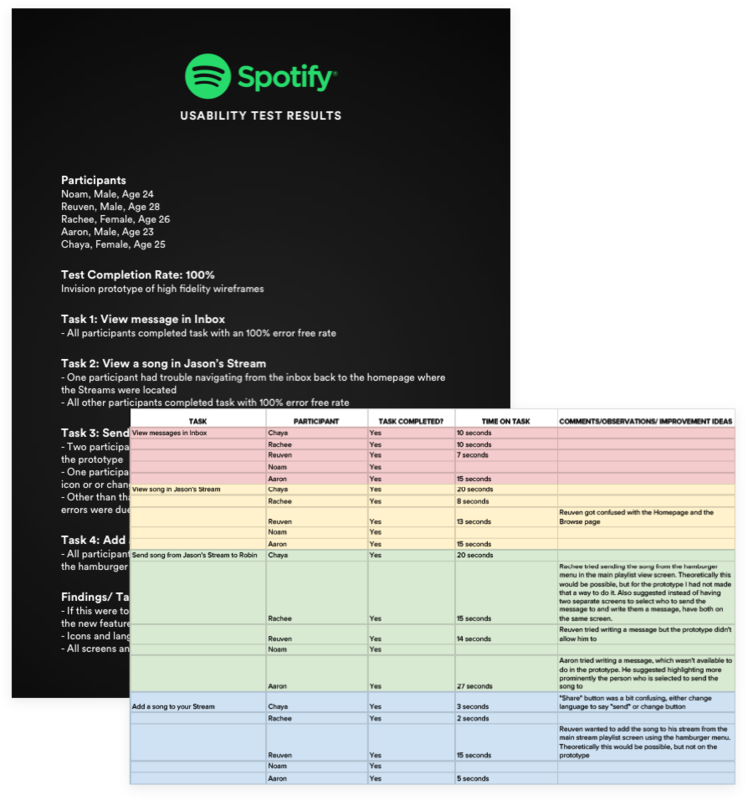 The prototype was tested on 5 participants, all current Spotify users. Overall, the participants were able to successfully complete all given tasks. The pain points were mostly due to prototype limiations and no onboarding explanation. The next steps for this project would be to create the rest of the screens nececsary for the new features and complete another round of user testing. During this round of testing I would make sure the all pages and paths to complete a task are accessible from the prototype. Aside from task based usability tests, I would also conduct multiple A/B tests to see what language and icons are most intuitive to users.